Kuan-Chun Lee is a Principal Scientist in the Environmental Stewardship and Sustainability organization at Procter & Gamble based in Singapore. Kuan-Chun leads the technical sustainability strategy, priority and efforts across the P&G’s 3-pillar palm sustainability program on supply chain management, independent smallholder program and industry standard and approach development. Kuan-Chun has been member of the RSPO Smallholder WG since 2014 and the recently established Jurisdictional Approach WG. He is serving in the 2018 RSPO P&C Taskforce and its interim groups on No Deforestation and Smallholder Standard. Kuan-Chun received Ph.D. in Environmental Engineering from Northwestern University, U.S.A. He joined P&G at the Kobe Technical Center in Japan in 1999, before moved to Singapore in 2011. His responsibilities covered environmental risk assessment, sustainable innovation strategy and life cycle assessment (LCA) to improve environmental footprints on renewable materials, solid waste, and products, and led the P&G / WWF Water Stewardship Program in China. 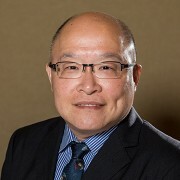 Professionally, he is currently the Immediate Past President of the Society of Environmental Toxicology & Chemistry (SETAC) Asia-Pacific Geographic Unit.